It’s time to ring in 2014 with some live jazz around town. 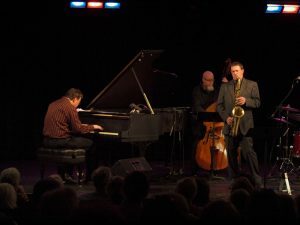 There are several venues in town hosting some live jazz for your New Year’s Eve plans covering all genres of the jazz spectrum. Looking for some big band and swing? The 94th Aero Squadron Restaurant on Sawyer Road is hosting an evening with the Rick Brunetto Big Band. The band is in its 28th year of serving the best in big band jazz. If smooth jazz and funky R&B is your thing, head on over to Shadowbox Live on South Front Street for a New Years Eve celebration with the Urban Jazz Coalition. The UJC has made a strong impression with traditional & satellite/internet internet radio stations propelling their last four CD releases, “Gravitate”, “A New Day”, “Down To Get Up”, and “Long Street” to each achieve “Top 50” status on international airplay charts, and to generate worldwide distribution of the group’s music catalog. Pianist Mark Flugge will bring his jazz trio to Hyde Park Restaurant in Upper Arlington starting at 8pm. Mark is joined by bassist Dave DeWitt and drummer Aaron Scott. Piano trio jazz at its finest here in Columbus. Vocalist Debe Wenig and pianist Bobby Hamlin perform at Club Diversity on 863 South High Street starting around 9pm. Debé performs jazz, blues, cabaret, Broadway, and pop with several talented and accomplished local musicians. The duo has released a holiday CD entitled Debé: Naughty and Nice. Trombonist Evan Oberla brings his band EOP to Brothers Drake for his hip-hop and funk inspired jazz. Local groove and Latin inspired jazzers, Clave Sonic, perform for their 4th or 5th year in a row over at Barcelona Restaurant in German Village starting at 7pm. Happy New Year Jazz Fans!